December 21st was Kalia's 10th birthday. Like other orcas at SeaWorld, she was able to "celebrate" with a jello treat. While watching the video below, one might be struck by what happens as well as the words coming out of the trainer's mouth. Kalia and her calf, commonly referred to as "Baby K", were brought out during the "Side By Side" segment of "One Ocean". Kalia was asked to do a few behaviors and at times the calf can be seen surfacing for breath, others, you don't know she is even there, The show then stops briefly to talk about Kalia's birthday as the trainers feed her jello while her mother Kasatka and brother Makani watch. This is a practice more for us than it is for the animals. 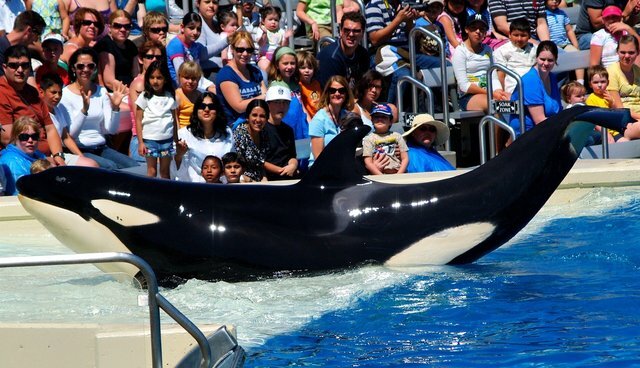 After all, it is unlikely that Kalia or any of the orcas have any idea that it's a day unlike the last and it is anthropomorphic to suggest otherwise. Furthermore, it is rare for an orca to be getting their treats without another whale nearby watching which, in my opinion, can only be described as teasing. All of this, however, is nothing compared to what the trainer herself says while Kalia is eating the jello: "And of course while mom is trying to get some special time the baby is trying to nurse." Kalia's calf is not yet three weeks old and yet she is being put on public display in shows and in the under water viewing. For a company that claims to value the bond between mother and calf so much, they seem to continuously put a strain on it. Kalia and her baby should be able to have a peaceful place in which they can bond and nurse without being interrupted by trainers asking for behaviors or loud people wishing for photos with the mother and calf. If "Baby K" is clearly attempting to nurse from her mother, why are you continuing to ask for Kalia's attention or distracting her with food? Why do you continue to put them into shows so that you can further your popularity? If you truly value the bond between these animals, why do you actions repeatedly prove otherwise? If SeaWorld wants to convince the world that they love and truly give good care to these animals, then they should start practicing what they preach.